The sketch shows Reggie with just one half of his trademark moustache. This was apparently the result of half of it being shaved off in a mess party. The date of 1.1.44 is probably a give-away to it having happened on New Year's Eve. 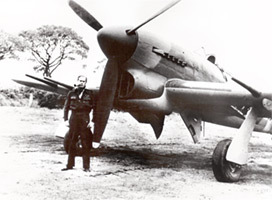 The heading picture of him stood by his Typhoon was taken in April 1944. He has no moustache. This sketch of Reggie was drawn by Sir William Rothenstein. He became known for his portrait drawings of famous individuals and was an official war artist in both World War I and World War II. (The original is in the RAF Museum at Hendon (FA03555)). Wing Commander Baker was a tall fair haired handsome character with a typical flowing RAF wartime moustache and the appropriate call sign of �Lochinvar�. He had a happy go lucky personality, full of animated anecdotes and generous use of clich�s using a plethora of words for ostentation to give splendour to his and our commonplace line shoots. Wholly extrovert always talking shop like most of us, his passion for words cared more for the expression for its own sake rather than substance. It made great and easy enjoyable listening. We nicknamed him �Young Lochinvar', a brave and glamorous knight amongst us. We all loved his flamboyant personal force and delightful character. His influence inspired laughter, enthusiasm and confidence and did much to facilitate a very high standard of morale throughout the whole of the operational unit, for both air and ground personnel. Wing Commander Baker DFC and Bar arrived to take command of the Wing on the same day. In addition to the (Operation) No Ball raids, the squadron was involved in wide sweeps over France seeking any target which might offer. These sweeps were known by the code name Rodeo. The squadron was also required to stand by to take on any enemy aircraft which might try a daylight intruder raid on southern England. Often the Squadron was scrambled, only to find that it was a friendly aircraft or even that there was nothing at all. ".... the amount of work to be done here simply appals me - they don`t seem to have a clue of any description . God knows how they have managed to live so far - actually they haven't as they had two shot down whilst I was away - nice greeting on my return . " " ...I am stuck down here with bad weather . Remember johnny johnson in oban ? . Met him t`other night in a pub - he was extremely surprised to see me , could`nt understand why I had left coastal - he has been doing a desk job for the last year and says he can`t get away from it ! . Then he wondered why I had left dead beat command !! . " " as you can see I am still stuck down here with bad weather . It really is awful having nothing to do but sit and look at the rain and the angry sea , my God , it is angry too . There are a couple of bodies floating just off the rocks here - they come rolling in at 6o`clock every morning and then roll away again . " 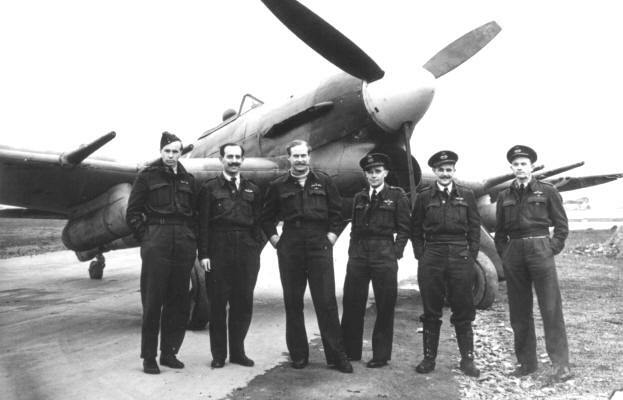 Four aircraft led by Wing Commander Baker took off on a small Ramrod operation. 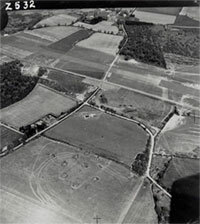 The target was a store, being four large sheds beside a railway at St Theggonneg four miles (6km) east of Landivisiau. The attack was low-level using eleven-second delay bombs, and was highly successful. At least four bursts seen slap on the target, shattering parts of the buildings and one burst right on two trains standing in the siding. Bombing height 150 feet. Rest of trip zero level. No flak.
" as you have probably seen in the newspapers I was out with the boys on a very amusing show t`other day - it was very good fun . Haven't yet received the copies of my portrait but they should be here any day now . " "... I am sending by post the portrait job , I think it stinks but then one never knows what one really looks like must say it shook me , I had no idea I looked anything like that !! " vanity , all is vanity " . Let me know exactly what the bottler thinks about it - she will probably roar with laughter if I know my wizard little daughter . `fraid this is very hurried but I am getting the boys ready for a big show this afternoon - hope the wily Hun will come up and play for a change . " Visibility good. Eleven aircraft led by Wing Commander Baker to Beaulieu at first light with 193 Squadron. Nine aircraft took off from Beaulieu with one of 193, now led by Squadron Leader Lefevre because the wing commander had a tyre burst. The following day, ten aircraft with the wing commander leading, took off from Beaulieu to sweep the Paris area but on reaching The Needles they were recalled as 50 enemy aircraft were reported operating and our formation was considered too small.
" I have had the wing away with me on detachment - quite near your home - in fact about three miles from where I proposed to you , remember , (The New Forest) . I literally haven't had time to shave during the last few days , never had so much to do before . Of course I want the quiet " family " life when this is all over just as much as you do . You don`t think I enjoy being away from you or missing seeing my lovely bottler growing up . I hate it and at times I feel desperately lonely , that probably sounds strange , my feeling lonely , but I do very often . At least I know I am doing this for you and the bottler and no matter what it costs me I shall fight to my last breath for you . At times you probably think I am awfully hard , I know I am but I have to be otherwise I couldn'tt carry on , deep down inside you understand I know . " Seated from left:- Rod Davidge, Bill Switzer, Johnnie Deall , Jim Darling, squatting n/k. 1st Row:- n/k, n/k, Percy Beake, Van Vancuylenburg, 193 I/O Dave Beedie, Butch Freakley, Digger Cotes-Preedy, Jock Inglis, Cass Cassie, Johnnie Brown, Killy Kilpatrick, Reg Baker, n/k, Peter LeFevre? [CO 266], n/k, n/k, n/k, Don McGibbon , Jimmy Haworth , Doug Borland , n/l, n/k, Derek Erasmus , n/k, 193 M/O Doc Chapman, n/k, 193 Adj Jonah Jones. 2nd Row:- Ned Statters, Gus Gough, Sac Bilz, Mort Soble, Wally Wallace, spinner, n/k, Ian Ross, n/k, n/k. 3rd Row:- Mike Bulleid, n/k, Paddy Pringle, Eddie Richardson, Rob Pratt, [on spinner] n/k, n/k, n/k, n/k, n/k, n/k, n/k. Many thanks to Chris Woodcock for painstakingly identifying the personnel on this photograph. On 1st February 1944 during the period of intense preparation for the Invasion of Europe, No. 146 Airfield as it was then called, began to form in a Sussex farmhouse on the edge of Tangmere Aerodrome. 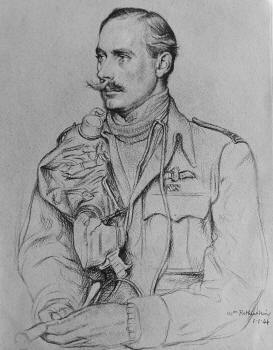 Wing Commander D E Gillam DSO, DFC and Bar, AFC was responsible for all initial arrangements, though he had not then been officially posted as Officer Commanding the Airfield. A number of famous squadrons passed through the unit during the early stages, including Nos. 183, 193 (Brazilian), 197, 257 (Burma), 263, 266 (Rhodesian) and 609 (West Riding) until concentration for the assault took place at Needs Oar Point, Hampshire, in April, when Nos. 193, 197, 257 and 266 Squadrons became the finally posted strength. Wing Commander Gillam was promoted to the rank of Group Captain and assumed command of the parent Unit No. 20 Wing, which also controlled Nos. 123 and 136 Airfields. Wing Commander E R Baker DFC and Bar, became Commander Flying of No. 146 Airfield with Wing Commander E W W Willis as Airfield Commander on the administration side. Under the brilliant leadership of Wing Commander Baker the Wing, operating at first from Tangmere and later from Needs Oar Point, successfully carried out a wide variety of missions directed against the enemy whoever he was to be found, on land and sea, and in the air. This 'softening process' a prelude to the Invasion included attacks on a large number of Flying Bomb sites in the Cherbourg Peninsular and in the coastal area between Dieppe and the Pas de Calais, over 700 sorties being made against this type of target alone, during the months of February March and April.
" ....we have been very busy , had some bad luck too . One chap was killed yesterday and Peter Le`Evre ( at F.T.S. with me ) was shot down on a show this morning . He was about 30 yards from me when he went smack in . " �We were approaching Gael airfield in Brittany right down on the deck and were actually slightly below the level of the airfield itself, which is on a hillside. We saw two FWs about to land and four more further south. Once was just going down but the other was going round again. I was lucky enough to go in first and get one which was making another circuit. He rolled over, burst into flames and spread himself over the field nearby. Reg would also lay claim to one FW 190 destroyed. Reg led eight Typhoons of 193 and 266 Squadrons on 10 Group Rodeo 80. By the end of the operation nine enemy aircraft were claimed destroyed and two damaged. On the approach to Etampes Mondesir aerodrome Reg reported enemy aircraft on the ground. The Typhoons swept into the attack. After losing touch with my No.2 in cloud I found my aircraft icing up and broke cloud at 700 ft, going down. After having sorted out the cockpit I suddenly saw a Do217 flying East at 600 feet/200 yards ahead. I closed to about 70 yards dead astern and below, and tried one short burst. The e/a burst into flames and I saw it hit the ground. I then discovered that I was steering east, so I changed my course to WNW flying at low level through snow flurries. I emerged from one of these and saw one FW190 flying NNW at 600 feet 500 yards ahead. I closed to 50 yards astern and slightly underneath e/a, and carried out the same attack as on the Do217. E/a�s engine caught fire, aircraft rolled over and I saw it hit the deck in flames. Still steering WNW in bad snowstorm I suddenly found myself over Paris at roof-top level, and immediately changed course to NNW. I saw the Arc de Triomphe from close range, also a game of football going on in a large stadium. There was no flak at all from Paris. I recrossed coast at 0 ft 8 miles SW of Le Treport, and eventually landed at Newchurch very short of petrol, although Shellpink had given me several vectors around 190 degrees as homing course for English coast. A full set of combat reports for this raid can be read [here]. An extraordinary few days for the Wing. 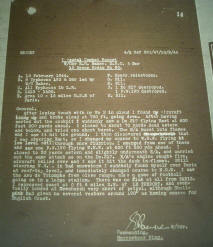 Reggie was certainly working his airmen hard to meet their objective of depleting the strength of the German Air Force.
" ...sorry I have been so long in writing , but I honestly haven't had a minute. We have been doing terribly well , destroyed fifteen and damaged four so far this month . I am feeling very weary , but we shall probably have a day off soon ." " feeling extremely depressed about today , three of the chaps shot down is not pleasant . Two of `em were cousins too . Still I suppose that is the way it goes - no wonder one becomes so hard and callous at times . As yet I haven�t any more news about my move , as usual I suppose it will all happen in a terrific rush . " " my move as far as the wonderful air force system knows , will not be until the beginning of next month . As I told you we lost three of the chaps t`other day , two in flames . The third one may well be a prisoner of war , we can only hope "
I was on a ranger Rennes, Gael area flying as Blue 2 at zero feet. We were flying south of Rennes on a westerly course when I sighted an aircraft, 4 miles away at 2,000 feet on my starboard. I reported same and was ordered by W/Cdr Baker to attack it. The aircraft which I recognised as a Ju88 was flying head on but started turning starboard there allowing me to turn port onto it. During the turn enemy aircraft was approx 200 yds and I fired my first burst at 70 degree decreasing to a stern attack and saw strikes on port main plane and engine which appeared to catch fire. I then broke underneath e/a, pulled up, made another attack and fired a burst but overshot. My No.2, Blue 3, went in and attacked a/c from astern. He fired one long burst and broke away, I then managed to drop back and fire a final burst at 100 yds closing in rapidly. Aircraft was burning furiously during this last attack especially starboard engine. I then watched e/a and saw one of the crew bale out. The e/a then crashed after losing height slowly, a column of smoke rising to 1,000 feet. Where e/a was seen to crash. During attack on the Ju88, flak heavy and light appeared to be coming from Rennes airfield. The enemy aircraft put his undercart down during first attack. I then joined up with the Squadron and returned to base. Total 40 rounds HE/I 40 round SAP/I � Total 80 rounds. I was Blue 3 to W/Cdr Baker on the 6/4/44. We were on a Ranger and had just arrived south of Rennes when Blue 2 (P/O Eastwood) reported an a/c at 3 o�clock. The e/a was at about 2,000 feet and we were on the deck. Blue 1 told B� to chase it, and B� and myself broke away, dropped tanks and climbed to meet the e/a, which was flying towards us. B2 did a � attack onto the JU88�s (identified) port, closing right up to it. He then broke away, and I came in and attacked. I saw strikes on his tail, and allowed a bit more deflection, and got better results, seeing strikes up forward and on the engines. It had been badly hit by Blue 2, and as I broke away I noticed the starboard engine blazing, and the port engine smoking well. Blue 2 then attacked again, and the Ju88 sailed down eventually and flipping into the deck, where it sent up a very thick column of smoke. The Ju88 had lowered his u/cart just as B2 made his first attack. One of the crew baled out after my attack. His parachute opened. There was a lot of heavy flak from Rennes aerodrome, and I think from Rennes itself. 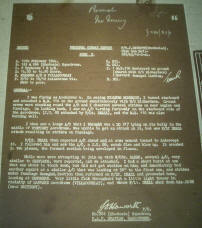 The CO S/Ldr Holmes silenced an AA post which was firing in the direction of Blue 2 and myself when we were attacking. The Ju88 did not return fire, and only carried out diving and slight evasive action. Total 25 He/I 25 SAP/I Total 200 rounds. On this Friday evening Reg attended a formal dinner in the Ship Hotel, Chichester where General Eisenhower was the guest of honour. The dinner was attended by nine Air Chief Marshals, Air Marshals or Air vice Marshals and 52 other senior officers. Air Chief Marshal Sir Trafford Leigh-Mallory presided with Wg Cdr D Walker as Mr Vice. Besides Eisenhower and Leigh-Mallory other well known officers included Sir Arthur Tedder, 'Sailor' Malan, 'Johny' Johnson, Sir Arthur Cunningham, Freddy Rosier, Harry Broadhurst, Roly Beaumont and John Cunningham. They dined on Filet de Boeuf a la Americaine and Christmas Pudding. Eisenhower gave an after-dinner speech and flew back to his Headquarters at Bushy Park the next day. He and Air Chief Marshal Leigh-Mallory sent to the officers mess a couple of boxes of cigars which they hoped would be found acceptable. On April 29th 1944 I was stationed at Needs Oar Point airfield near Beaulieu with 197 Squadron, 146 Wing, Tactical Air Force, when we were first called at 4.30am. At that time we were under canvas and breakfast was taken before reporting to the briefing tent. 197 Squadron was a Typhoon fighter bomber squadron and we were given our first mission of the day as a Ramrod[a] over France , however the weather was bad over France, and we turned back, the bombs being dropped on a secondary target. We returned about 7am and were told to remain on standby. About 7.45 the Wing formed up for a formation flight to Harrowbeer Airfield, north of Plymouth. On arrival we were told to go to the mess for breakfast and then report for briefing. Later that morning we were told that our target was Morlais in the Brest Peninsula. It seemed that a number of vessels were moored in that area. I was Wing Co Baker's No. 2 and we took off and flew low-level before sighting the French coast at which point the Wing climbed to 12,000 feet, proceeded inland and then turned for our attack on the ships, and the quickest way home. We then mad a dive bombing attack on the ships moored below, before pulling out at 1500 feet doing about 550 knots (632 mph, 1020 kph). I recorded in my log book of seeing one direct hit and two near misses, the rest of the Wing followed and we formed up for a low level flight in Battle formation for our return journey to England. No aircraft were lost although there had been plenty of light flak and also balloons to cope with. Back at Harrowbeer we were told to remain on standby. However, no further orders came through and we returned to Needs Oar Point the following morning. Pilots moved through three stages of readiness in preparation to scramble. 1st Stage: 15 minutes readiness for one hour. 2nd Stage: Dispersal readiness with parachute in the cockpit for one hour. Under conditions of cockpit readiness the pilots were strapped in the cockpit , the engine was kept warm and everything was switched on ready for immediate start up and take off. When the Tannoy loudspeaker system called for that section to scramble the pilots simply pressed the buttons to activate the Coffman starter and opened up the throttle, taking off across the grass and runways in the direction the aircraft was pointing. At the same time red Verey lights were fired from the dispersal hut and the control tower to warn other aircraft that a section was scrambling. It was a matter of Squadron pride to be airborne within seconds and there were some dramatic take offs. One of the most interesting I saw was a pilot who had unknowingly selected "flaps down". His flaps were coming down as he raced across the 'drome and he finally took off with full flap. He worked out what had happened shortly afterwards, pulled the flaps up too quickly and almost squashed into the ground. 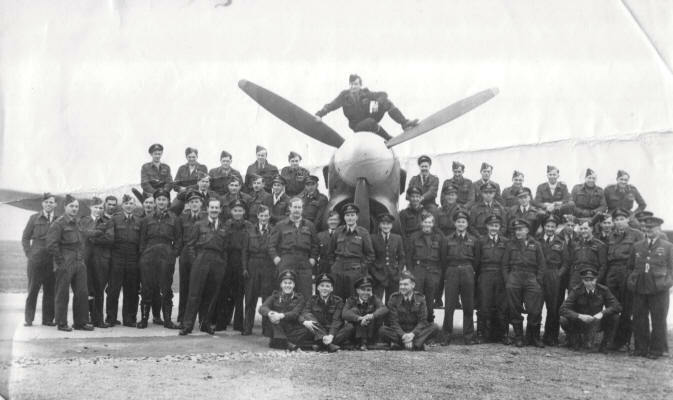 The readiness programme was carried out between offensive operations later on by all pilots and when the Squadron was away on a mission by the pilots who were not on that particular mission. "The intervention of the tactical air Forces, especially the rocket-firing Typhoons was decisive. They came down in hundreds firing their rockets at the concentrated tanks and vehicles, we could do nothing against them". "We feared the Typhoons most of all, these aircraft continued to attack a target in spite of heavy ground fire causing complete devastation, coming around again and again It created a low morale from which we never recovered, I was lucky to survive, the only possible means of escape was to get out of our tank and run". The title of the No.146 Airfield was changed to 'Wing' and that of the parent to 'Sector'. It was obvious that the vast Armada necessary to transport the Invasion forces, must achieve complete surprise in order to make a successful landing on the shores of France and so the fait went forth - Radar Installations from Cap de la Hague to Cap Gris Nez must be destroyed! This formidable task was allotted to Nos. 123 and 146 Wings. By Reg Baker's 146 Wing alone, over 400 sorties were made despite the intense flak guarding these vital points, the attacks were pressed home to point blank range. As is now known these missions were entirely successful and on June 6th the Invasion was launched and covered by continuous air patrols, landed on the shores of Normandy while unsuspecting enemy broke his fast. 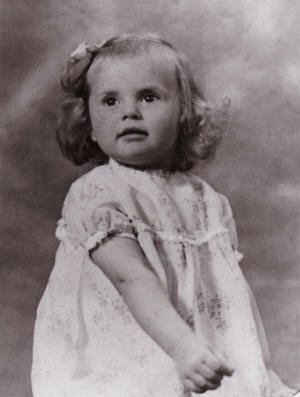 Stephen Reginald Baker, son of Reg and Norma was born in Abingdon Berkshire. Reg wrote from 146 Wing C/o GPO Beaulieu, Nr Brockenhurst saying how pleased he was that Norma had given him a son on Empire Day.
" ..have managed to ring up three times to ask how you both are - very pleased and relieved to hear that all is well . Do you realise what you have done ? Presented me with a son on Empire Day - seems to me I first met a certain tall attractive blonde in dark glasses for the first time on Empire Day 1939. Have been trying very hard to come and see you and the bottler too but I simply cannot make it . Received a wonderful large coloured picture of the bottler . I have had it framed and labelled " The Baker Bottler " and it sits in front of me and watches me working at the desk . P.s. Could you use a book on " how to fly " for Steve yet ? . Feel it is probably a bit early !!! . " On 6 June we knew the invasion was on. The day before we came back from a dive-bombing trip and later we went out again from Tangmere where we�d landed to search for Squadron leader Ross of 193 Squadron who had baled out over the Channel just south of the Isle of White. We couldn�t find him but we were flying across in a long line, searching the sea, when we suddenly became aware of all these boats, hundreds and hundreds of boats, as far as the eye could see. It was an incredible picture and our Wing leader, Reg Baker, called up and ordered R/T silence � . . . not another word until you land.� So when we got back he said, �Well, obviously you know tomorrow�s D-Day� � and that was it. Flight Sergeant A Shannon, (257 Squadron) commented on the scene set by Reg Baker on the eve of D-Day. Wing Commander Baker . . . got us all together on the evening of the 5th and said the possibility is that I won�t be with you here tomorrow and many of you may not be here tomorrow � but it�s going to be a great day for all of us. Circumstances rather overtook us and we were quiet rather than thrilled or emotionally affected by it, more or less reflective. Greatest day in our lives - Invasion Day. All the boys in readiness at 0430 roaring to go but nothing doing for us in the morning and we waited round for a show, listening to all the news broadcasts etc. In the afternoon the first show was laid on and the boys clobbered some tanks - nice work. Another `op' was laid on but there was no joy in this as no targets were found. Packed up about 2200 hours everyone feeling pretty tired and ready for bed. At last the day for which we have all been waiting has arrived. All last night our aircraft were over France in great numbers. At first light we had the honour to share with 266 Squadron two bombing shows on territory later to be occupied by our own troops. Both shows were successful. Our show was led by S/Ldr Taylor leading one section and W/C Baker the other. We all waited hopefully for the return of the aircraft to find out how the big show was going on. Our hopes were raised when we were told of how everything appeared to be going smoothly the other side. Squadrons from the Wing attacked targets for our forces a11 today. Later in the day our squadron once again started sorties against ground targets. Good results were seen in all cases. Tanks, MT and dumps were attacked along with anything else which may have been of use to the enemy. We finished our work late in the evening just as the night bombers were again going out. Der Tag - but ours. Not such a heavy programme as anticipated, but almost all our pilots ranged over the beachhead once, and to the south seeking and attacking enemy transport. Shelling from our warships was visible as spasmodic flashes, no Hun aircraft were seen by any of our chaps, but Spits and Thunderbolts, patrolling over the massed shipping in the Bay du Seine approached our formations enquiringly several times, but sheared off as recognition dawned. A fairly successful bag of assorted transport including tanks, trucks and staff cars were `britched up' and a tented Hun camp was strafed. The occupants of one staff car tumbled out and sought shelter in a chateau. This was promptly demolished by a direct hit with a 500 lb bomb. There was little flak opposition in all these prangs. D-Day, everybody tense. Boys over the beaches when first landings were made, a wonderful sight. Sgt Mitchell crash-landed on the beachhead. No activity during the afternoon. After D-Day 146 Wing Typhoons roamed inland of the beachheads attacking gun positions and MT, bombing troop concentrations in woods and villages, bombing enemy HQs, and carrying out armed recces. Several vehicles and a gun and trailer "bought it" while other transport were left smoking. Strikes were obtained on about 12 transports in all. Very good show! 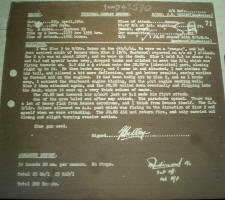 197 Squadron's Ken Trott describes what a typical armed recce was like. It was usually four or eight of us being led over France, from this country in the early stages. Over France what sort of height we would fly at depended on who was leading. We would be looking for targets, usually MT or tanks. When a target had been selected, whoever was leading would give an indication of what it was and we would then go in line astern or spread out a bit depending on what it was. If it was a road convoy then obviously there were several vehicles. You would be in battle formation anyway, which would be four aircraft spread out, and the other four would come in behind. You would go in and attack the target and hopefully blow up the transport. We usually carried a couple of bombs and of course we had our 20 mm cannon, using either depending on what the target was. You could be told of the target in the air. Whoever was leading could be called up on the radio and given a map reference. But generally after D-Day an armed recce was going round an area, Caen generally, looking for anything that was likely to move. But of course despite operating virtually free of Luftwaffe intervention, there was still considerable danger to the low flying fighter-bomber pilots of the tactical air forces. Flak was the main opposition; some pilots force-landed, some used the emergency landing strips, some had to bale out and others were seen to go down in their aircraft. Losses would rise. I received a very newsy letter from you this morning, it was like a breath of spring, no war, nobody being killed, just a picture of quiet home life. I had hoped to see you before this assault on Europe started, but it couldn�t be so; nor shall I be able to see you before going to the other side. Try not to worry I am doing the job I have always wanted to do and I am very happy about it. This is very short because I have so much to do. I will let you know as often as I can that I am alright � always remember no news is good news. God bless you and keep you safe and the children.